What do Martha Stewart and the White House have in common? The both have John Boos & Company products in their kitchens. And with proud American heritage, quality materials, and chopping boards of the highest calibre, it’s easy to see why. 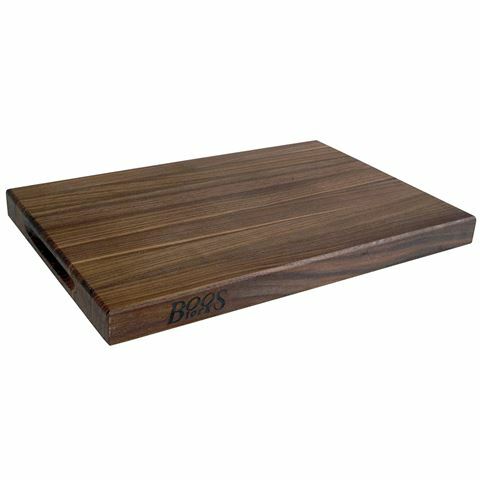 Makers and purveyors of the very best in American chopping boards and butchers’ blocks, John Boos & Company have been producing fine hardwood boards since 1887. A family business based in Effingham, Illinois, their products have gone from the Boos family workshop to the highest office in the land. Made from genuine, sustainably sourced Black Walnut, these beautiful boards preserve the edge on fine cutlery and knife ware and are safe for all food preparation. To maintain them, it’s essential that you treat the wood every three to four weeks with the Boos Mystery Oil and the Boos Board Cream – both designed to seal the wood, polish, and enrich. That way, the stunning hardwood won’t dry, bleach or crack after sustaining repeated washings and chopping – and your board will last for years. Ideal for professional kitchens and the avid home cook alike, your kitchen will be all the richer thanks to John Boos & Company. Made from genuine, sustainably sourced American Black Walnut wood. Preserves the edge on fine cutlery. Safe for all food preparation. Care instructions: Wipe with a damp cloth or hand wash with mild soap and water. Do not leave wet or submerged in water. Treat with Boos Mystery Oil and/or Board Cream (available separately) every three to four weeks to adequately maintain. Dimensions: 45cm (l) x 4cm (h) x 30cm (w).